Our Rome at Twilight tour is a feast for the senses, an exquisite Rome experience never to be forgotten. 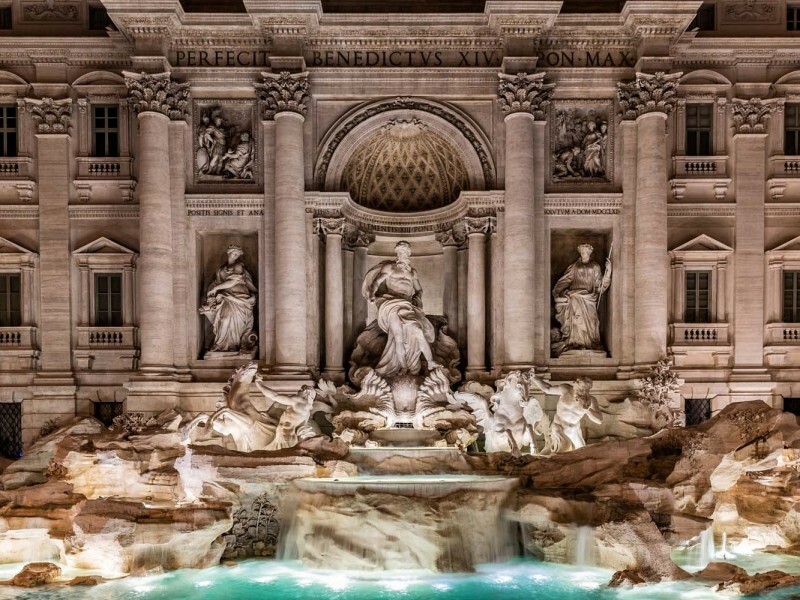 The enchanting Trevi Fountain appears as if by magic, immersed in the labyrinth of Rome's cobbled streets: it is the sound of the cascading water that alerts you to its proximity, drawing you towards the enchanting piazza. Once in front of this magnificent sight, it's difficult not to be astounded by the procession of marble figures who appear to dance before our eyes as they vividly recount stories and legends from Ancient Rome. The fountain is an epic celebration of an old Roman aqueduct that had fallen into disuse in the Middle Ages before being restored to its glory during the 17th century, immortalised by the Tritons emerging from its waters. Our expert guide will take you on a fantastic Rome journey, piecing together the complex history woven into the city's most spectacular sites, from Piazza Navona to the Spanish Steps. Entering Rome's massive ancient temple to all the gods, the Pantheon, is an unforgettable experience, where you'll gaze up at what is still the largest unsupported concrete dome the world has ever seen spectacularly spotlit by sunlight streaming through its central oculus (please note that we do not enter the Pantheon on our Sunday evening tour, as the site is closed. 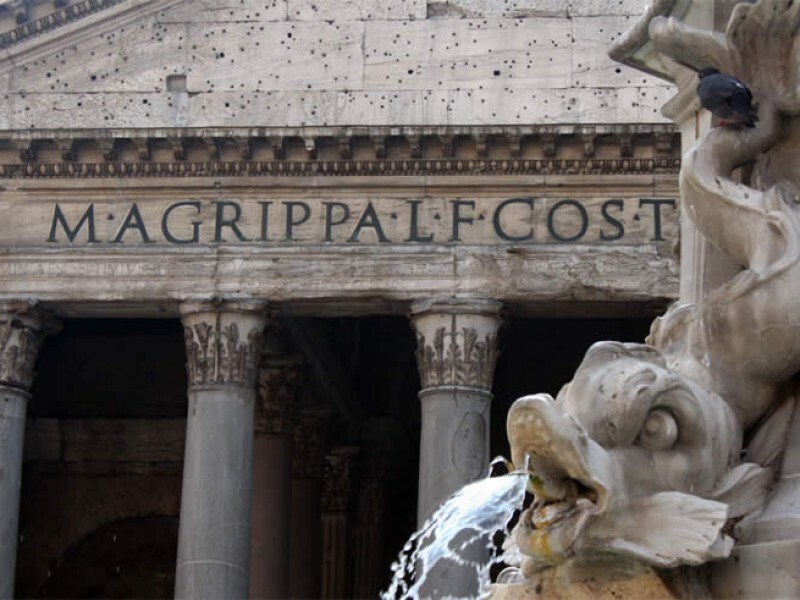 We will still admire the exterior of the great edifice from spectacular Piazza della Rotonda). Join us on this special journey into the heart of the Eternal City where history seems to live in every stone - all bathed in the enchanting colours of a Roman sunset. 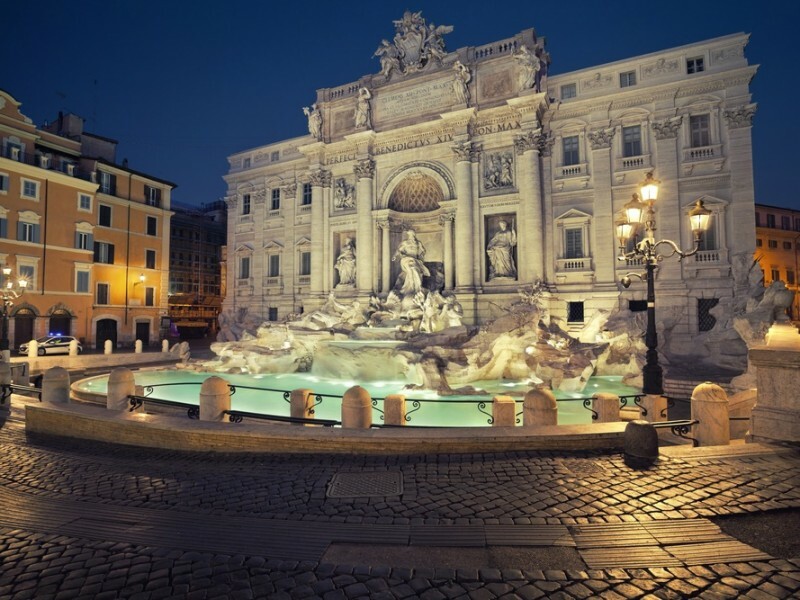 Join us on an evening stroll to appreciate the splendors of Rome; wander past its imposing palaces and through its grand piazzas, where water dances in the extraordinary fountains that occupy pride of place in Piazza Navona, the Spanish Steps and, most impressive of all, in the Trevi fountain. On this tour you'll discover enchanted little streets of Rome where time has stopped; a stroll to dream, exploring history and art in a new way. Join us on this group tour where we'll encounter popes and emperors, artists and ordinary people in the places where their lives took shape, where the ancient and the modern mingled to create the political and religious institutions on which Italian society still rests today. 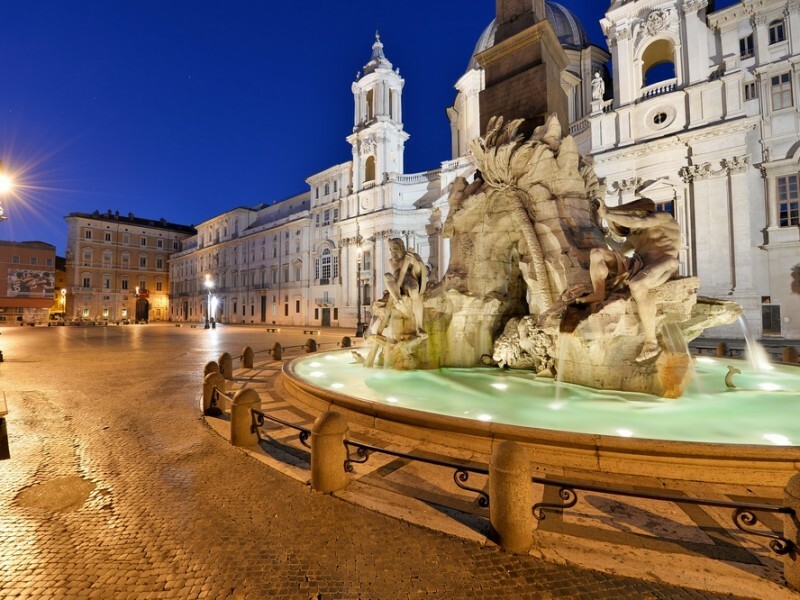 We will begin our journey into the atmospheric heart of the Eternal City in one of Rome's most iconic public spaces: Piazza Navona. Its long and distinctive shape has been part of the city's urban fabric for nearly 2,000 years, beginning life as the ancient Stadium of Domitian whose shape is still obvious today. And yet at the same time we are in the heart of the Roman Baroque: all around are spectacular optical illusions and theatrical buildings, signs of a revolutionary new approach to architectural space. Here we'll confront the geniuses of Bernini and Borromini, the two greatest rivals of their age and opposites in every respect. 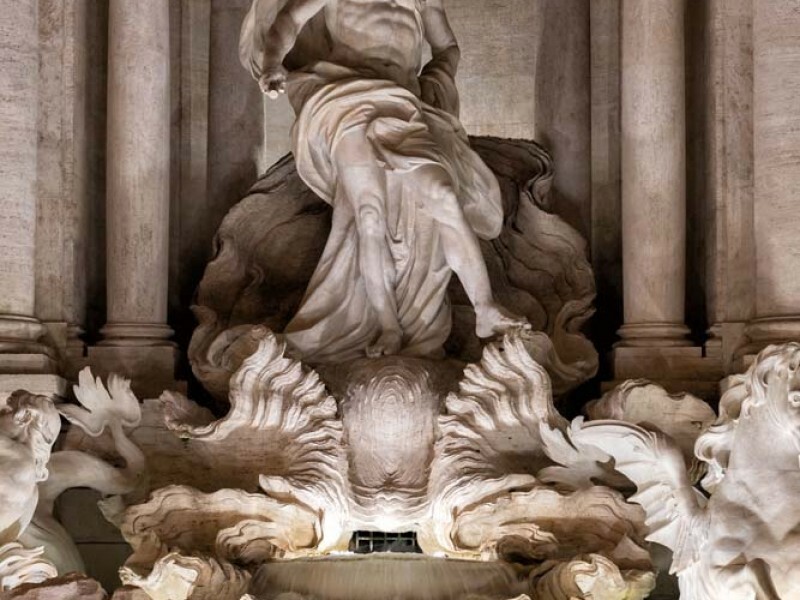 Bernini's marvelous Fountain of the Four Rivers is the piazza's centrepiece, a pyramidal structure that incorporates an obelisk and culminates in the flight of a dove. Dominating the skyline above is Borromini's curving facade and bell tower of the church of Sant'Agnese, where stone takes on the malleability of softest clay. Entering the magnificent Pantheon will transport us to another era, and this portion of our walking group tour is all about the grandeur of Imperial Rome. Innovative ideas, technologies and various cultures blend to make an artwork of extreme power and poetry, a design so perfect that Michelangelo considered it to be the work of angels. The history of the area is no less fascinating: it was originally a marshland subject to the floods of the Tiber, then a military training ground devoted to Mars, the god of war. The temple that dominates the piazza was first built by Agrippa for his son-in-law Augustus, before a restoration by Hadrian in 126 AD created the magnificent building we know today. According to medieval legend the central oculus in the huge dome was created by the explosive crash of pagan demons fleeing the building at the moment of its conversion into a church in 609 AD. The Pantheon also houses the tombs of Raphael who died prematurely in 1520, and the first King of Italy, Vittorio Emanuele, who died in 1878. Please note that we do not enter the Pantheon on our Sunday evening tour, as the site is closed. We will of course still visit the piazza and admire the great edifice from the outside. To complete your exploration of the magnificent remains of the ancient city, be sure to check out our in-depth tour of Colosseum, Roman Forum and Palatine Hill. Here we will let ourselves be lulled into tranquility by the magical song of the waters, immersing ourselves in this wonderful piece of theatrical architecture that recalls the great buildings of Ancient Rome. 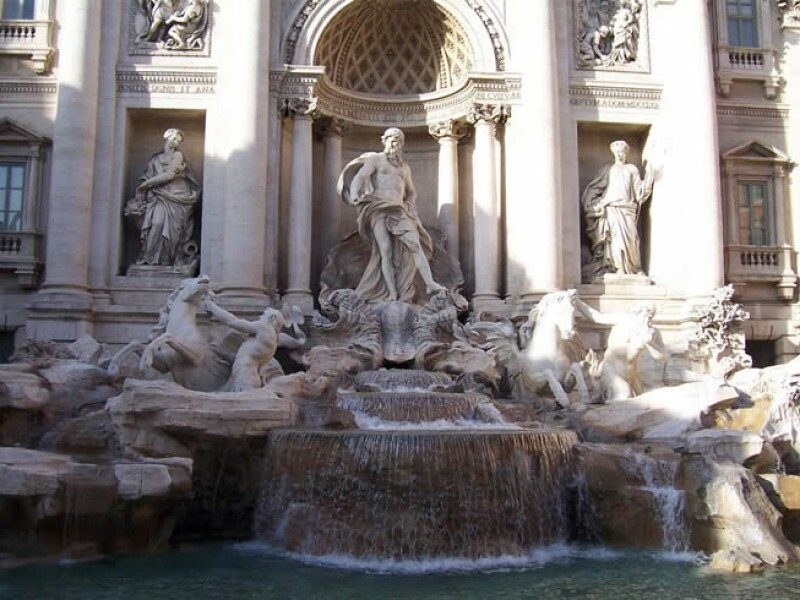 The main structure of the Trevi Fountain is a triumphal arch, taking its inspiration from classical examples such as the Arch of Constantine. 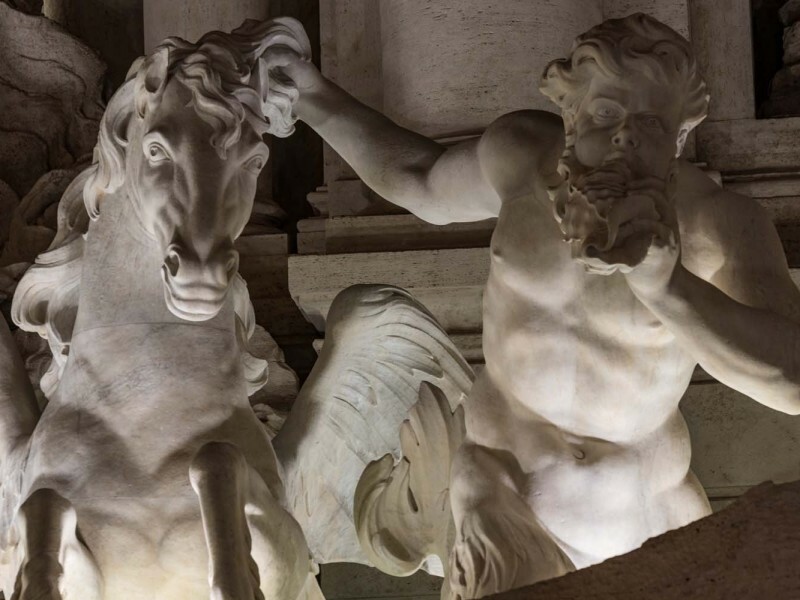 With the help of your guide you'll decipher the legends depicted in the sculptures of the arch, from where the god Ocean advances with his Tritons and winged horses to celebrate an ancient festival of water with us. 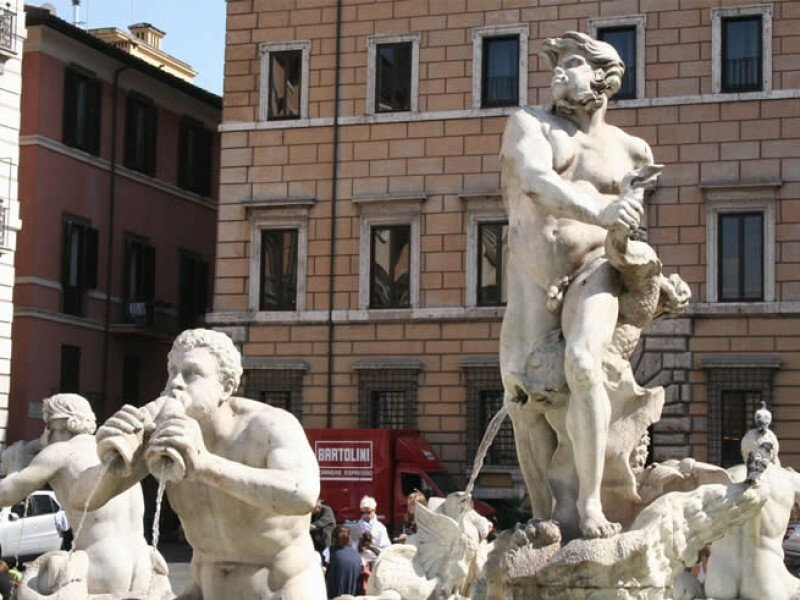 You will also learn about the origins of the fountain in an ancient Roman acqueduct, as well as its history through the centuries. Our tour finishes in the magnificent Piazza di Spagna, home to the iconic Spanish Steps. 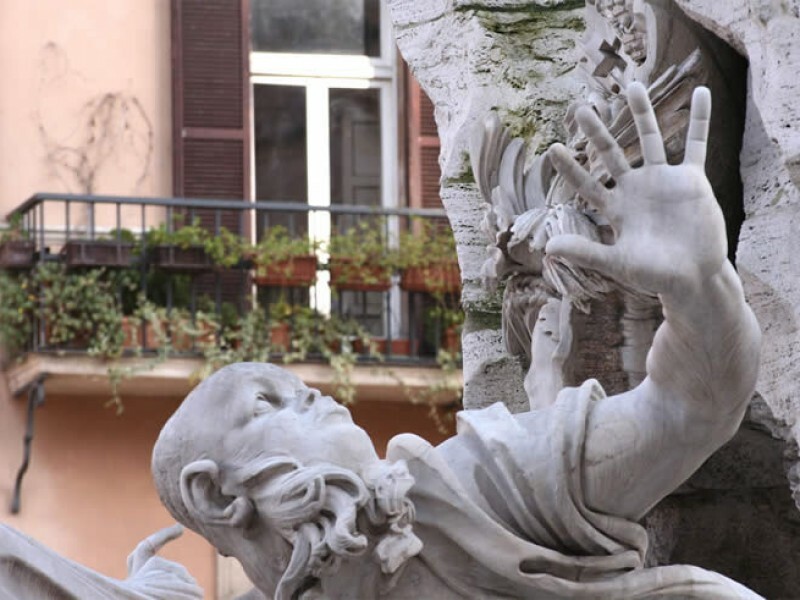 With our expert guides we will learn the history of the church of the Trinita' dei Monti that towers above, as well as why the young Gianlorenzo Bernini and his father (also a sculptor) adopted the unusual subject of a boat for the fountain of the Barcaccia. We'll also uncover the social significance of the majestic stairway that came to unite these two areas, which for centuries had been separated by a cliff face. 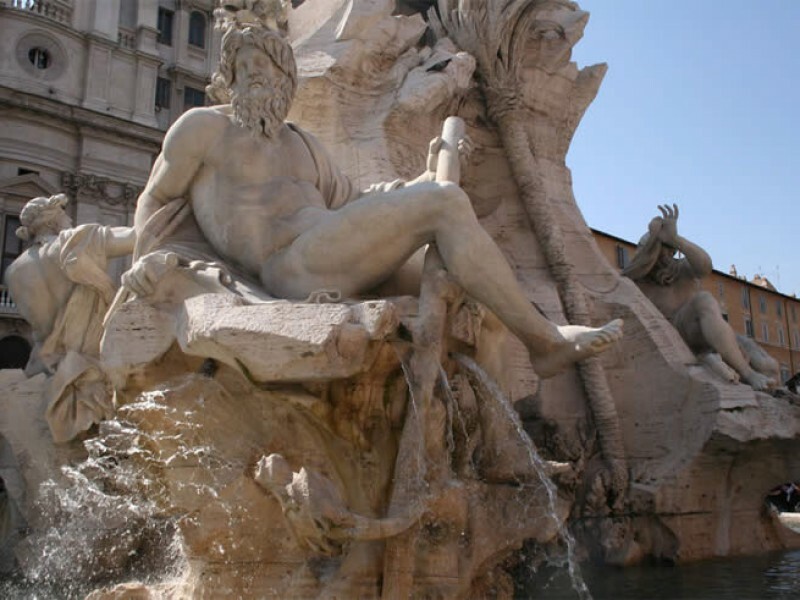 Join us on this Rome group tour on a journey to understand the true character of the Eternal City, and see how its picturesque streets and timeless piazzas conceal fascinating histories and magical artworks just waiting to be discovered. In front of a Toy Store called Al Sogno. Full details, including a map and photo, will be issued on booking. This tour was our first view of Rome and Thomas did very well in showing us the site that were planned and some that were not. His history of Rome helped us understand a lot of what we would be seeing in the coming days. Our guide was John - Informative, Professional and made the whole experience very pleasant . Even gave us tips about how to get around and beat restaurants . Though the tour was to last for 2 hours - he was not time restricted and actually gave us another half an hour on a Sunday evening! Must do if you have limited time .